Picked this up tonight in its home city. No date visible on the six pack cans, but they look new FWIW. Pours with a large white head which leaves very good lacing. Excellent retention. Transparent, slight haze, light golden-amber body. Aroma is sweet up front, with tons of tropical fruits. Flavor follows through - tons of the tropical fruitiness, with a an above average amount of sweetness that is perfectly balanced with the high bitterness. Carbonation is good, mouthfeel is good, maybe a little heavier than average for the style; it's always hard to tell for me what makes this exceptional in an IPA. This is an exceptional IPA that is a borderline DIPA. I might pick up another sixer on my way out of town. Really felt like I got lucky with this one. We crack a pair of cans, pouring into our Great Lake pints glasses. Coloring nears a darker golden at its core, with a peripheral pale lightening of a few shades. It holds a chunky two finger head of soapy but tight khaki bubbles, showing nice retention. Lacing is wispy and thick. A mildly chill haze follows the pour, but no sediment is noted. Carbonation is slow but pervasive. The aroma is comprised of sweet caramel and pale malty dustiness, black pepper, sugary vanilla bean and icing, bright nectary and grassy hoppiness, lemon-poppy seed muffins, apple and wild blueberry skin fruity bitterness, toasted honey oat sweetness, jasmine pollen and musk, butterscotch caramels, and toasted clove spiciness. The flavoring follows in much the same vein, with cotton, soapy laundry detergent, bitter and spicy hops of piney, herbal, and grassy hoppiness, grapefruity skin and zest, crumbly and dried biscuits dusty pale malts, sweaty caramel and crystal graininess, green twig and dandelion weediness, dried mustard seed, spicy ethanol, faint bubblegum esters, and bitter walnut shells. The aftertaste shows an enhanced minty and planty quality that leaves a zing towards the far back palate. The body is solidly medium, and the carbonation is medium. Each sip affords hearty and full slurp and smack, with appropriately concurrent cream and froth as the beer makes its way around the mouth. The mucosa is cooled and dragged down with thick coating, but this gives way to a lightly chalky astringent dryness. The abv is true to style, and drinkability remains nice. Overall, this is our “climbing” beer, through and through. Although we brought our own cooler full of swill on our inaugural trip to climb the Red River Gorge in Slade, Kentucky, this was recommended as a must-try from the local climbing community. Purchased at what was seemingly a barn, around the corner from where we camped, this got us through many a night on the crag, accompanied of course, by custom Miguel’s pizzas. We enjoyed its company so much, in fact, that we stopped for a few sixers to bring back to Michigan with us. We find a pleasant IPA here; one that is flavorful and honest. The hops show you what it means to be bitter, but allow enough balance from the malts to not overwhelm the palate. If you’re an IPA fan and in the neighborhood, we too, would now recommend this as a local “must-try” at the very least, comparatively. Pale golden in color. Cloudy. Subtle hoppiness on the nose. Clean on the pallette. Very smooth. Easy drinking for a 7% ABV. Canned from Loquor Barn on Lexington. This is the third beer I've had from West Sixth and I must say, I am thoroughly impressed! They are now 3 for 3 in my book. They also make an excellent cocoa porter and their imperial stout is among one of my faves! Appearance - Very cloudy yellow with an orange hue when held to the light. Generous one and a half finger head that shrinks to about one finger after sitting for a minute but retains very well. Heavy lacing. Smell - The scent of this brew is very pleasant. Sweet citrus (tangerine? ), pine, and dank grass being most prominent. Taste - The taste is very Piney, wheaty, and most definitely...HOPPY! (does this surprise you?) well it is an IPA, after all! The wheat, hops, pine, and citrus give this beer excellent balance and delicious flavor. Carbonation is moderate and mouthfeel is crisp. Aftertaste is dry, piney, and hoppy. 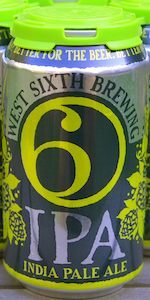 Overall - Another excellent brew from West Sixth Brewing Co! They have definitely proved themselves in terms of quality and consistency. Looking forward to trying another one of their beers! I picked up a six pack at the Liquor Barn in Lexington while recently passing through Kentucky. It was canned on 04/19/16 and I'm pouring it in my 13oz. tulip for the occasion. Look- Pours a reddish gold color leaving a small finger of white foam. Smell- Pine, some grapefruit, malt and a hint of yeast. Taste- Grapefruit zest followed by some pine and spice. There's a floral flavor in the finish along with some caramel malt. Feel- Malty slick with a slightly bitter and spicy hop bite. Overall- A drinkable beer, but nothing spectacular to report. It's too malt forward for my palate and lacking any significant hop flavor. I love trying new/local brews when traveling, I'll pass on this when I'm in Kentucky again. Picked up a single 12 oz. can of this to try on a recent trip to Kentucky and south western Ohio. Poured into one of my pint glasses, this beer pours a slightly cloudy/hazy medium golden amber color with a very fluffy looking head that is about an inch thick when first poured that settles fairly quickly to a solid 1/5 inch tick head with excellent lacing. Aromas of slightly toasted caramel malts along with resinous, piney, herbal hop notes. The taste is pretty much the same, with some biscuity, slightly toasted, caramel malt sweetness upfront along with some resinous, piney, slightly citrus, herbal, slightly spicy/peppery hop bitterness. A very solid and well balanced flavor profile. The hop bitterness does tend to dominate a bit taste wise I feel. Has a crisp, yet smooth, slightly oily and chewy, medium bodied mouthfeel with moderate carbonation. Has clean finish and bit of a dry aftertaste. A damn solid IPA all around that is certainly worth a try indeed! 12 oz. can. Hazy orange body. Big white head. Nose is grapefruit and onion hops. Light pale malt. Tastes more of orange hops with a little pale malt sweetness. Has a kinda floral hop flavor around the edges. Moderate bitterness. Medium body. A little bit creamy. Better than I expected. Purchased in cans on my trip to Kentucky. Beer pours a medium golden color with mild haze, mostly clear. Small head that retains lacing throughout the pint. Smell is of citrus and pine. Taste is up front clean bitterness- citrus peel and a hint of pine. Very little malt flavor is detected at first, but on the backend some light carmel and bready flavors emerge very slightly. Hop flavor is decent combination of grapefruit and some pine, and a touch of grassy. This has to be heavy on the Cascade hops - it has the taste of a high-powered Sierra Nevada Pale Ale. A small touch of juicy tropical hop (Citra?) is there in the background. Finish is decent, but could use a little more malt flavor to support the bitterness. I like this beer - it is not great. Solid American IPA entry, needs more malt and hop balance to elevate beyond “good”. Draft, age unknown; doesn't taste old, but not is there a crisp freshness. Basic AIPA, decent balance. Definitely worth having at least one. Can to dogfish head tulip/goblet combo glass. A. Murky dark amber color with healthy eggshell head that slowly retreats to a frothy head. Poor clarity. Substantial lacing. S. Moderate fragrance. More tropical hops with notes of pineapple, apricots, grapefruit, and mango with a noticeable underlining of resin. T. Moderately bitter. The resin comes through the from the hop profile with some citrus. A minor note of bootstrap leather. A decent amount of hops. M. Moderately smooth, high carbonation, moderate body. O. Not bad at all. Its my local ipa so that sums up a lot. It's not bad for my go to. I keep it around but compared to the big boys it comes up short. KY is out of the range of year round top shelf west coast ipas so it has developed a nice niche. Poured into a clear beer stein. Has a cloudy amber color, moderate carbonation, and thick head. Smells spicy in hops and piney, with hints of tangerine peels and other citrus aromas. Tastes citrusy to balance out the spicy hops, but is all light to the mouth. Poured from can into teku. Pours slightly hazy orange with a single finger white head. Smell is very tropical, lots of pineapple, piney. Taste is also full of tropical flavors, grapefruit, pineapple, orange, slightly bready, pine resin, perfect hop presence, almost no malt caricature, texture is as expected. Overall I am very impressed with this ipa, it's very balanced, not a hop bomb, and a great west coast style profile. I love the consistancy. This is my first W6 brew, and I'm impressed.